The UN says Yemen has witnessed a sharp spike in the number of suspected cholera cases this year, as well as increased displacement in a northern province. CAIRO — A United Nations humanitarian agency said on Monday that Yemen has witnessed a sharp spike in the number of suspected cholera cases this year, as well as increased displacement in a northern province. The report from the U.N. Office for the Coordination of Humanitarian Affairs says 100,000 suspected cholera cases were found across Yemen from the beginning of the year until March, and over 190 people have died. In the capital, Sanaa, the physician Saddam al-Azizi said last week's numbers exceeded 50 cases per day at al-Sabeen hospital, one of the largest in Yemen. He told The Associated Press that most of the cases were acute watery diarrhea, and 20 percent were confirmed cholera cases. Yemen has witnessed two outbreaks of cholera and acute watery diarrhea since 2016, with over one million suspected cholera cases and some 3,000 deaths recorded nationwide. The U.N. agencies have deployed cholera vaccines to limited areas starting Mary 2018. Cholera is caused by eating contaminated food or drinking water, and U.N. agencies have been working to support water, sanitation, hygiene and health facilities in Yemen. The aid agencies said that the epidemics are rooted in the country's collapsing health system after four years of conflict. 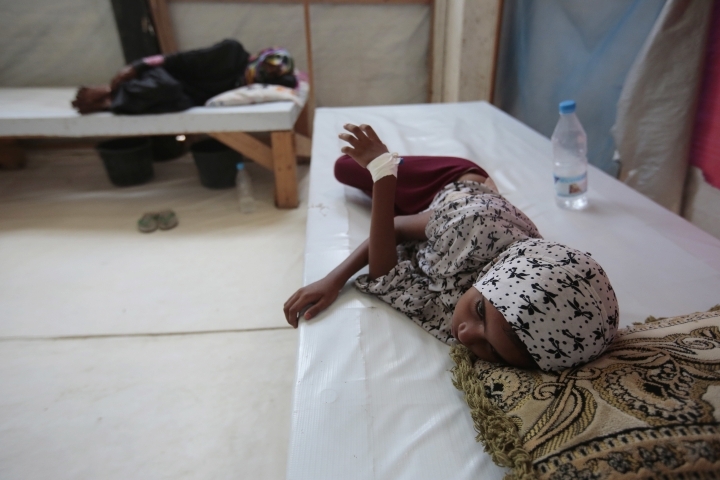 Spikes in cholera cases usually take place during rainy seasons in Yemen. "It's mainly because of the rain, which sweeps the garbage and sewage, and it ends up in water wells," said al-Azizi. Wells are the main source of drinking water in many parts of Yemen. Yemen's grueling civil war pits Houthi rebels — who control northern Yemen — against the Saudi-led coalition backing the internationally-recognized government. The war has forced the displacement of more than three million people and left most of the population food insecure. In Monday's report, the U.N. also said more than 10,000 families had been newly displaced after fighting ravaged the northern province of Hajjah. Thousands of people were caught in fierce clashes between warring factions in a district in Hajjah governorate called Kushar, a mountainous area only 50 kilometers (31 miles) from the border with Saudi Arabia. It has been isolated from the outside world — roads and all communication lines are cut after Yemen's Houthi rebels imposed tight control over Kushar this month after powerful local tribesmen took up arms against them in late January.